The impact of uranium mining on indigenous communities. The climate change debate positions nuclear power as a partial solution to carbon emissions according to some scientists and politicians. Uranium mining speculation lacks comprehensive health and safety regulations while the ethics of Canadian exported uranium, which can lead to depleted uranium used in zones of war, needs greater scrutiny. Abandoned uranium mines and the subsequent hazards experienced in forgotten communities have also been virtually ignored in Canada leading to tragic, unmitigated circumstances. 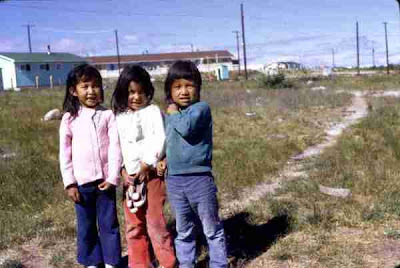 The long-term negative impacts of uranium mining can be witnessed in the small, rural community of Déline (North West Territories) which has a Dené population of 800 people. They are located right on the shore of Sahtu (Great Bear Lake) about 300 miles north of Yellowknife. Great Bear Lake is considered to be one of the last great fresh water lakes in the world. This area on the north shore of Sahtu was the site of radium mining from 1934 to 1939, and then a uranium mine from 1943 to 1962. During the mining era the Dené of Déline, mostly men worked as labourers and as coolies carrying gunny sacks of radioactive uranium ore and concentrates on the transportation route. Waste from both radium and uranium mines were dumped directly into the lake and used as landfill. 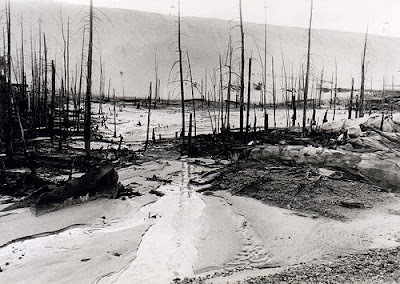 Port Radium was owned and operated by a Canadian crown corporation but uranium ore and concentrates were extracted, milled and sold to the US Government for the Manhattan Project to build an atomic bomb during the Second World War. Déline in the North West Territories. The mine initially operated under the emergency regulations of the War Measures Act. The circumstances and time-line mean that retroactive mitigation and compensation are an enormous legal challenge and decades later the Dené continue to pay a high price in environmental and health effects. No warnings were issued at the time about the hazardous and toxic nature of these ores and so people took no precautions regarding their drinking water or their traditional foods. In 1975 young men from Déline were sent to work in the tunnels on a Government training program without masks for radon gas exposure. In 1997 ten young men were sent with only two hours of training to clean up “hot spots” of radioactive soil in Sawmill Bay without shower or decontamination facilities. Once again the Dené people of Déline were not informed of these hazardous exposures but recent information mean that they now live in constant fear of their contaminated land, water, animals with ongoing concerns about their health and survival. Déline is known as the “village of widows’ because most of the men who worked as labourers in the mines have died of some form of cancer. The widows, who are traditional women, were left to raise their families without husbands and breadwinners. As a result they became dependent on welfare and relied on the young men who remained in the community to help supply them with their traditional foods. The women are struggling and the village is seeing the first generation of young men in the history of the Dené to grow up without the guidance and teachings of their grandfathers, fathers and uncles. This unfulfilled tradition threatens the cultural and spiritual survival of the only community on the Great Bear Lake. 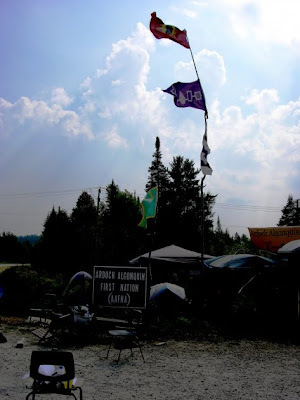 In 1998 the Dené First Nation lobbied the federal government for compensation and mitigation. On September 6, 2005, Déline community members were given the disappointing findings of a five-year study to examine the health and environmental impacts of the government-owned radium and uranium mine which had operated for almost thirty years in Déline. Although the community had lost 15 former ore transport workers to cancer the report stated that the numbers of deaths were insufficient to prove unequivocally the link to the mine. By not acknowledging the full health consequences of uranium mining the government offloads the responsibility to compensate or provide justice to the Dené First Nation. To date consultations with government are still underway with anticipated costs for remediation in the millions of dollars. An agreement about cause and affect has not yet been reached. In a related situation in Port Hope Ontario, NDP MP Nathan Cullen called for an investigation in 2007 into Health Canada’s denials of the health risks of uranium contamination with the accusation that profits are influencing policy. These issues remain unresolved in 2010 even though increased uranium mining is imminent in some Canadian provinces. Uranium exploration near the world famous Thelon Game Sanctuary in Nunavut alarmed the Dené and Inuit communities who are dependent on the caribou herds that use the area for grazing and calving. The current land use plan for Kivalliq (Keewatin) has been in place since 2000 and prohibits uranium mining in the region until Nunavut’s environmental assessment process has reviewed all the related environmental and health impact issues. In contradiction to the local land use plan Nunavut’s Inuit land claims commission adopted a policy in favour of uranium mining returning the legacy of uncertainty to the area. Their policy framework provides the tenuous rationale that uranium mining and nuclear energy could mitigate some of the climate change impacts in the north. The policy does not account for the quantifiable fossil fuel usage in uranium exploration nor resolves issues about the impacts of nuclear waste storage. They assert that environmental and health concerns related to uranium mining have been resolved but provide no supporting evidence. Dissention rapidly gained momentum from the Inuit in Baker Lake and the Hunters and Trappers Association who demanded a moratorium on all mining exploration. The vehement opposition to the uranium mine proposal near the Thelon Game Sanctuary eventually led the Mackenzie Valley Environmental Impact Review Board to recommend rejection of uranium exploration at Screech Lake in 2009. However a junior mining company from Vancouver, Kaminak recently struck a deal with Nunavut Tunngavik Inc (NTI) to allow uranium exploration in the Kivalliq region, about 200 km inland from Whale Cove. The deal, or memorandum of understanding, is unusual for a few reasons. It’s the first time NTI has given permission for a company to hunt for the radioactive material on Inuit-owned land. The deal would give NTI partial ownership of the spin-off company created by Kaminak to search for uranium and the hope of economic progress. Uranium development in Saskatchewan dates back to the 1930s when the first discoveries were made in the far north. Since that time controversial uranium exploitation has undergone several waves of investment and although it contributes to the nuclear industry and is opposed by many NGOs there has been virtually no opposition from any political party in Canada. Today uranium is one of Canada’s leading exports with the highest percentage being mined in the province of Saskatchewan on indigenous lands. The wilderness of the north is a land of glacier lakes and pine forests with low lying areas dominated by peat bogs and black spruce. To the west of the Athabasca Basin is a large, unique area of sand dunes. Clean water and land has sustained a wide variety of fish and animals which was the foundation of social and economic development for aboriginal people in the area for many years. The land is rich in uranium deposits but this hazardous mining industry poses a considerable threat to the natural ecology and the values of people who live on the land. At the heart of this issue is a system of indigenous beliefs and culture which regards them as inseparable from the land, the waters and the animals. Environmental assessment panels have often listened to the submissions of aboriginal people in the area who have expressed deep concerns for the toxicity of uranium mines. The impact of mining on their ancestral lands where they are the traditional custodians contravenes their spiritual and cultural beliefs. Conversely emerging job opportunities in a struggling northern economy have out of necessity led to the partial cooperation of some native bands with uranium mining projects. 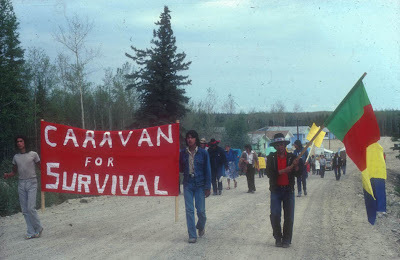 In 1993 the La Ronge Indian Band gave their support to the Kitsaki uranium mining development at Rabbit Lake citing increased economic benefits for their community, with the caveat that environmental impacts were closely monitored. Employment opportunities are short-term and hazardous but highly financed propaganda to promote the benefits of uranium mining to northerners potentially trumps aboriginal self-determined, sustainable, economic alternatives. Harding also argues that the geopolitical uses and long-term environmental effects are being hidden, and outweigh the short-term economic gain by which communities and governments are sometimes wooed. He cites the Harper government’s eager acceptance of nuclear energy as evidence that Canada is going down a path of misplaced intentions. The potential for economic growth and the need for employment have resulted in some aboriginal labour initiatives in the mining industry. The Athabasca Basin Development Ltd. Partnership (ABDLP) was established in 2002, and is 90% aboriginal owned. 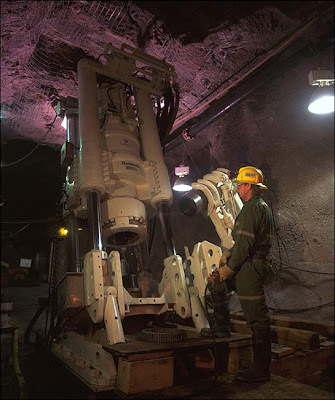 ABDLP provides services to both mining exploration companies and the main operating uranium mines in the region. In total, some 600 northerners work for ABDLP in winter road maintenance, freight and transportation, mine camp setup, janitorial services, security and underground mining services, as well as line-cutting for seismic exploration. However the environmental, health and social impacts of uranium development extraction on aboriginal communities in the Canadian North remain an urgent concern to many communities. Mining activity has altered the landscape through the construction of roads, new settlements and the underground mine sites. Ore extraction and processing have released dangerous chemicals into the air and water and in spite of the participation of the ABDLP there is still a predominance of non-native labour which has displaced and marginalized local indigenous people. Primarily it is the large multinationals, not the local people who benefit from the multi-million dollar uranium mining industry in Saskatchewan and elsewhere. In the United States Canadian uranium mining speculation has increased in spite of indigenous opposition and a long legacy of life-threatening damages on Navajo Reservations. Barrick Gold of Canada which nets profits of over 1.5 billion dollars a year is active in uranium exploration in New Mexico but it has not committed sufficient funds to adequately address the contamination that has already destroyed four aquifers in Navajo territory. The uranium industry is attempting to convince the public that it will bring high-paying jobs and tax money to the state by buying advertisements in local papers and other news media while paying industry representatives to testify at hearings. More than 300 participants from 14 countries participated in the event, with a variety of topics including international efforts to halt uranium mining, and the devastating effects on health and culture. Indignation grew as they realized that American Indian uranium miners in both the United States and Canada (Saskatchewan and NWT) had been sent to their deaths to work in the uranium mines long after scientists warned of the health hazards of radon gas and radiation. Notwithstanding the continuous outcry, uranium production in Canada is likely to increase significantly in the coming years. The Harper regime is poised to align its policies with Obama’ renewed pro-nuclear power stance as a solution to climate change! Several new Canadian mines, now planned or under construction, go into operation sometime after 2011. The two largest projects are Cameco’s Cigar Lake mine and Areva’s Midwest mine, both in northern Saskatchewan. Canada is the world’s largest producer of uranium with about 60% exported to the United States where depleted uranium is manufactured as weapons. Many abandoned uranium mines have left behind a devastating legacy but the nuclear industry has re-branded itself as a viable solution to global warming. The profitable Canadian uranium mining industry lacks serious scrutiny; meanwhile remote indigenous communities are especially vulnerable to hazardous impacts thinly veiled as economic promise. Map of uranium mining activity in Canada. * Canada is the world’s largest uranium producer, accounting for 20.5% (9,000 tonnes U) of world output in 2008. * Production comes mainly from the McArthur River mine in northern Saskatchewan province, which is the largest in the world. * Production is expected to increase significantly after 2011 as the new Cigar Lake mine comes into operation. * With known uranium resources of 499,000 tonnes of U3O8, as well as continuing exploration, Canada is in a strong position to meet future world demand. Only Australia has more known uranium resources. * There has never been a uranium mine in British Columbia. * The BC Energy Plan clearly states that nuclear power will not be a part of B.C.’s energy supply mix. 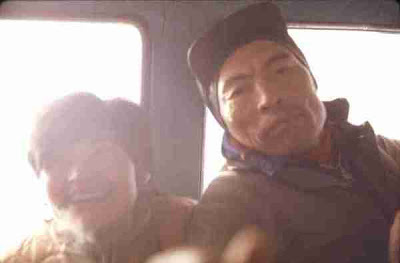 Also visit the website of the documentary The Return of Navajo Boy here. This entry was posted in Arctic, Energy, First Nations and tagged Mining, Nuclear, Uranium. Bookmark the permalink.